For those who are tired of paying a cable or satellite company for TV, there’s yet another skinny bundle Internet TV package, Google’s YouTube TV, which joins the likes of Sling TV, DirecTV Now, and PlayStation Vue. It costs $35 per month now, and will be going up to $40 per month soon, but if you sign up before 13 March 2018, Google says you’ll be grandfathered into the $35 price indefinitely. YouTube TV isn’t at all new. In fact, it’s about a year old. 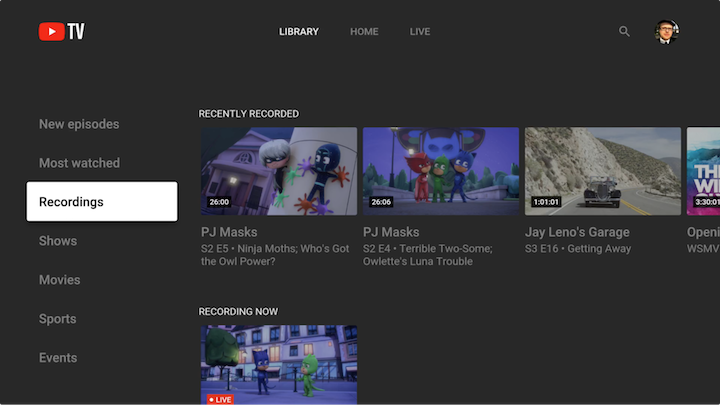 But only recently did Google release the YouTube TV app for the Apple TV, which brought it above the bar necessary for us to cover in TidBITS. So far, I’ve been impressed with what I’ve seen. Unfortunately, to subscribe to YouTube TV you must live in one of its viewing areas, all of which are in the United States. Sorry, international readers. In addition to the Apple TV app, YouTube TV is also available for iOS, Chrome, Android, Chromecast, and a handful of other platforms. It’s also integrated into the Google Home line of smart speakers, so if you have one of those and a Chromecast-connected TV, you can say stuff like “OK Google, play CNN” to watch the news. Channel Lineup — Although all the Internet TV services are roughly similar, they do differ somewhat in what channels they offer and what features or design elements they emphasize. YouTube TV focuses on simplicity. While Sling TV offers lots of packages (see “Sling TV, a Cord Cutter’s Delight, Arrives on Apple TV,” 6 July 2016), YouTube TV offers just a single plan, though you can also subscribe to a few premium channels: Showtime, Fox Soccer Plus, Shudder, and Sundance Now. There’s no HBO, but that’s what HBO Now is for. Along with most of the channels you’d expect, such as ESPN, Fox News, and MSBNC, YouTube TV has just added Turner networks, including Adult Swim, Cartoon Network, CNN, TBS, and TNT. It will also soon offer NBA TV and MLB Network. Which channels you want is highly personal, but here are a few notable channels that are missing: BET, Food Network, Hallmark, MTV, and Nickelodeon. If you’d like to watch those, look elsewhere for now. Personally, I subscribe to a service like YouTube TV purely for live news and live sports. I can watch scripted content on services like Hulu and Netflix later. What impressed me about YouTube Now’s lineup is that it provides all the major local network channels in the Nashville area: ABC, CBS, Fox, NBC, and the CW. YouTube TV is the only one of these services that does so well in this part of the world. Your mileage will likely vary. Unfortunately, there is no easy way to check which channels are available in your area until you sign up for service. You can cancel before finishing the signup process, and there is a 7-day free trial in any case. FOX has not secured the rights to NFL games on its national feed, FOXNet. Users in Albuquerque, Austin, Birmingham, Cincinnati, Cleveland, Denver, Grand Rapids, Greensboro, Greenville (South Carolina), Harrisburg, Hartford, Indianapolis, Kansas City, Milwaukee, Norfolk, Portland, Raleigh, Sacramento, Salt Lake City, San Diego, Seattle, St. Louis, and West Palm Beach will not see NFL games on FOX. You also can’t view NFL games on mobile devices due to the NFL’s deal with Verizon Wireless. But otherwise, I’m pleased with the sports lineup, since it has the Fox Sports channels that are essential for Atlanta Braves baseball and SEC Network to watch University of Tennessee football. Again, your desires will likely differ. 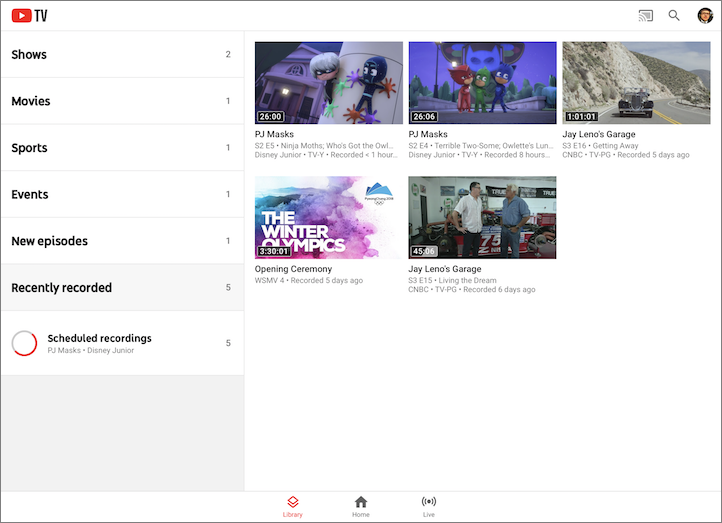 But if you’re looking for some speed skating or luge in the Olympics, YouTube TV has everything you need for that: NBC, CNBC, NBC Sports, NBC SN, and the Olympic Channel. YouTube TV also has an exclusive benefit, in that it lets you watch YouTube Red original shows for no additional charge. Frankly, I don’t care and you probably don’t either, but it’s there if you want it. One thing I don’t understand is why YouTube doesn’t bundle YouTube Red — which combines ad-free YouTube, background audio, Google Play Music, and other features in one monthly fee — with YouTube TV. It seems like a missed opportunity. Interface — First impressions count, and YouTube TV does it right on the big screen by directing you to visit a URL on a computer or phone to activate the app. That’s vastly preferable to trying to type in a (long and random) password on the TV screen with a Siri Remote. In iOS, it’s even easier if you’re already signed into another Google app — just choose the account you want to use and you’re done. What’s most striking about YouTube TV is how clean it is. If you’re used to bad cable and satellite box interfaces, YouTube TV is a revelation. It has just three screens: Home, Live, and Library. The Home screen displays programs Google thinks you’ll like, along with popular shows in different categories. The Live screen, as you’d expect, provides a program guide to what’s currently airing. Finally, the Library screen holds your saved content and DVR recordings. 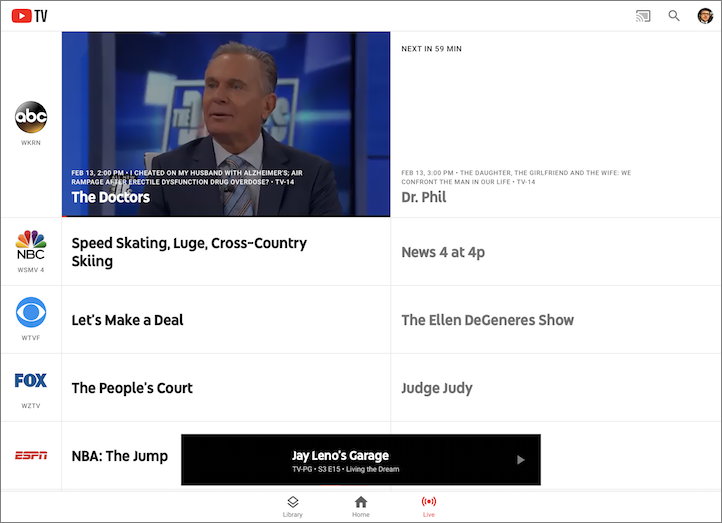 Overall, YouTube TV’s interface is uncluttered while still being both functional and attractive. The Home screen shows live video previews of what’s on. The Web version of the Live screen offers nice, big pictures of each channel, and on the iPad, the Live screen displays a grid with live video previews. Some have complained that the YouTube TV interface isn’t optimized for each device, which baffles me. Check out the screenshot of the Library screen on the Apple TV below and note that, while it’s showing the same information as the iPad screenshot from above, it’s optimized for the Apple TV interface. I’ve tried YouTube TV on an Apple TV, iPhone, iPad, and even an Android TV, and while it’s a little different on each platform, never so much so that it’s confusing. In summary, it feels like YouTube TV’s user interface is working with you, rather than forcing you to fight with it every step of the way. Perhaps it’s not surprising, since Google undoubtedly has a large design team, whereas most other TV services — Internet or traditional — have long employed color-blind marmosets to design their interfaces. Features — YouTube TV is more than just a pretty face — it’s also one of the most capable of the Internet TV services. 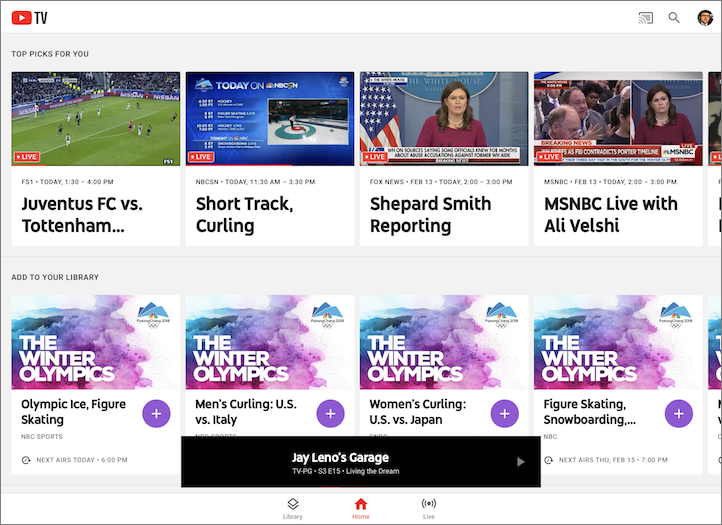 YouTube TV features a cloud DVR to record programs with no storage limits — YouTube TV stores your recorded programs for up to 9 months. You can record as many programs as you like at the same time, and you’re also free to skip ads on recorded content. Amazingly, cloud-based DVR isn’t yet standard for all of these services, and it often isn’t as well implemented as what Google has done. It should come as no surprise that YouTube TV, being owned by Google, has the best search of any of these services. And it’s not just about finding programs, but what you can do with them. 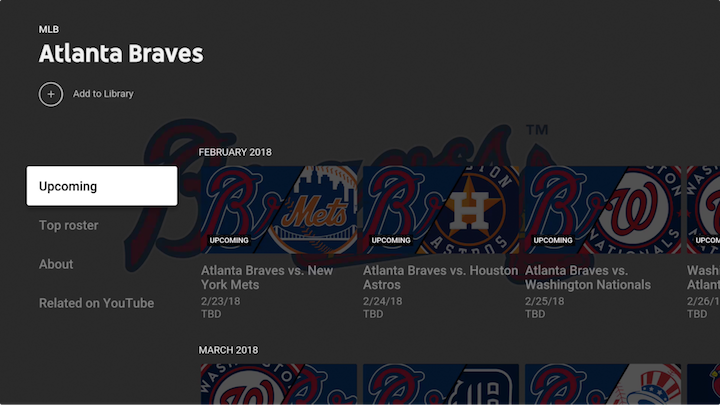 For instance, if you search for a sports team and add it to your Library, YouTube TV will automatically record every game and suggest it in your Home screen, as it has done with the Atlanta Braves below. Another especially welcome aspect of YouTube TV is that, much like regular YouTube, it lets you browse content while continuing to watch your current show. More services should do this. Finale — Overall, YouTube TV looks and performs well. Even on my slow Sony TV running Android TV, it performed admirably. However, it is missing some key channels. Nor does it support Apple’s single sign-on feature, which lets you authenticate multiple TV provider apps at once. However, in my experience, that feature often doesn’t work like it should. Sadly, I think I’ll be without YouTube TV for a while, as I couldn’t resist an offer from DirecTV Now that promised a free $179 Apple TV 4K if I prepaid for three months of service, which was just $115 after taxes and fees. I hadn’t previously used DirecTV Now, so I was filled with almost instant buyer’s remorse when I saw how slow, frustrating, and outdated its interface is, despite offering a larger lineup of channels. In fact, it’s so disappointing that I may pay up for YouTube TV anyway and write off my DirecTV Now subscription as a cheap Apple TV. But what’s wonderful about living in the this era is that you’re no longer locked to cable and satellite giants like Comcast, Dish, and DirecTV — at least as long as you have a decent Internet connect. There are a slew of TV services now, competition is fierce, and you can jump between them as you please. I keep hearing about "cutting the cable", being "locked into Comcast" etc. "All you need is an Internet connection"
OK, so, how does one obtain that Internet connection without having a cable or satellite account?! That seems to usually double-the cost of these other "services" which seldom provide even 50% of the channels. YMMV, of course, but I'm not going to move just to get cheaper TV! LOL! Most of the programs I see offered aren't worth walking across the room for!! You are right, for most channels you need a cable subscription. A lot of these services are just bundling like cable, I don't see a point in them. We cut the cord and only subscribe to Netflix. Sure there is stuff my wife and I miss. For us, it's a cost savings and we are happy with the sacrifice. Through this we've actually surfaced a lot of Youtube creators we enjoy following. I'd pay $3-5 month to add individual channels if given the opportunity, but that model is not really in existence yet. For most of the channels you'd want, it'd probably be a lot more than $3-5 per month, and some channels do offer individual subscriptions. For example, a quick Google search let me find that Hallmark Movies has a subscription service for $5-6 per month (my in-laws really, REALLY love Hallmark movies). As far as the point to these services, for me personally I like being able to sign up for the Olympics or the World Series and then cutting it off until I need it again. Dealing with a traditional TV provider is a nightmare. Yeah, it's a real problem if your bandwidth is capped or your service just stinks in the first place. There is a useful site to compare all the streaming TV services at www.suppose.tv. You enter the channels you watch and it shows the TV option and costs. Very cool, thanks! But it's a little out of date. It says DirecTV Now doesn't offer NBC in my area and I know for a fact that it does. Is there an internet TV streaming list of US channels available in Taiwan? I'm subscribed to Netflix and want to find another. By the time I finished making my selections, I would be paying about what I pay now with DirecTV! As somebody who doesn't watch "TV" but does watch NetFlix, HBO etc - mainly movies, documentaries etc - I'm happy with my DirectTV subscription - $35/mn + free AppleTV. Early days it was iffy and it still has it's moments but they threw in HBO Now as an apology for the early days service and that also gets me HBO Go so I can watch all the HBO stuff (current and past). I'm also on their Beta program testing their DVR functionality. The new UI is much better than the old one so it is getting there slowly. When relatives are over and they want to watch the game or the wife with her cooking shows it's all there for them. Personally I spend a bunch of time watching YouTubers myself. Honestly, I don't watch a ton of TV myself, and I tend to watch more YouTube now also. I subscribe to these services for special events. DirecTV Now is okay, it gets the job done, but I find the UI infuriating. Thankfully I can just activate the NBC Sports app and watch the Olympics there. I'm curious about what portion of the current Olympics you can get with this - only what is on the main NBC channel? I have cable (COX) and have my DVR set to record all the Olympics NBC is offering on all its channels. We skip through most of it later. It sounds like that is not an option here. Everything, as far as I can tell, as it has all the channels the Olympics are on. You can see in one of the screenshots that it offers Olympic events to record. Ideally there would be one "channel" per Olympic sport. My wife only likes Figure Skating in the Winter Olympics and Gymnastics in the Summer Olympics, along with the Opening and Closing Ceremonies. Other than that, most of our TV watching are both local & national news and a few programs on ABC/CBS/NBC (right now it is only about 5 CBS programs). You seem to be satisfied with the AppleTV application. "It’s a terrible, terrible Apple TV app. Much like Amazon’s new Prime Video app, it looks and feels like it was designed and implemented by people who’ve never even used an Apple TV." I gather you wouldn't agree. He was talking about the redesigned regular YouTube app, not YouTube TV. I've received a number of comments/questions along those lines, so I'd say this is a branding issue on Google's part. As for the new YouTube app, it's, uh, not great, but I don't think it's *that* bad. However, it looks a lot like an Android app. But if you're used to YouTube on other platforms, I think you'll find it more familiar than the old one. The YouTube TV app is a lot better as an Apple TV app. I also signed up for DirectvNOW to get the Apple4k ... but have now dumped them in favor of YouTubeTV. Using the ROKU app which works well with the remote to navigate YouTubeTV. DirectvNOW has the worst streaming performance and still lacks Cloud DVR... always cutting out. YouTubeTV provides a wonderful, steady streaming experience. And CloudDVR is unlimited so you just choose a series or news show and current episodes are ready and waiting. Navigation is simple and elegant. Yep, my thoughts exactly. DirecTV Now has a slightly better channel lineup (besides missing the local ABC affiliate), but the interface is horrific. Apparently it's like all the other services in NOT offering any access to PBS (and suppose.tv confirms). About 50% of my viewing time is shows I record from one of two local PBS affiliates via DirecTV. Does anyone know why PBS isn't in any of these cord-cutter bundles? Is it PBS management that's the problem? There is a channel on Sirius/XM satellite radio that broadcasts some NPR programmiong. Now I know that NPR is not the same as PBS, but using it as a model, I think I understand the lack of PBS options away from standard TV. NPR declined to let Sirius/XM broadcast its mainstream shows: All Things Considered, Morning Edition, Fresh Air, etc. The rationale is that NPR depends on the good will of local member affiliates and would rather not undercut their fundraising or their program development for the network by directing listeners away from the local stations. I suspect PBS follows the same rationale. If you donate to PBS on an ongoing basis at $5 or more per month (or $60 a year) you are a “passport” member and can get streaming access to some oftheir shows, and can authenticate that way. When I created my PBS account, it just let me enter a ZIP code and I can watch anything in the PBS app. Is that still not the case? You get some, but not premium/high-demand shows, if you stay on the free tier. Anything with the compass-rose graphic is donators-only streaming. No one answered Jim’s original post at the top. How do you get internet service without a cable provider? You could just use 4G data via your iPhone, for instance. Regardless, Internet is separate service from cable TV in most places and from most providers. We get our Internet connection from Spectrum (previously Time Warner Cable), but we don't pay them extra for cable TV. Yes, just an Internet broadband connection with sufficient speed starts around $75 or higher WITHOUT bundling a phone and/or cable plan. I get my 12MbS from AT&T via fiber to the node, copper pair to the house. That would be good enough for a cordcutter sub; it handles HD video streaming fine. Other providers exist, e.g. sonic.net in the Bay Area.